The planning process followed a traditional approach by collecting content to develop topics and themes; conducting visitor research to identify target audiences; and finally recommending several interpretive methods. I took it a step further by including measurable outcomes for the visitor experience (e.g., 30% of visitors will have touched the water in the Arroyo Seco in the last year) and strategies to avoid (e.g., avoid programs that serve the general public). The biggest challenges were the large number of “sites” (nearly 40), wide range of organizational capacities (a few with a huge staff, most with a very small staff), and the lack of an organization to coordinate and lead activities for the region. As the result, I adjusted the typical interpretive plan format to make recommendations for individual and groups of sites to allow efforts to proceed whether sites were able to work together or not. Secondly, it prioritizes these recommendations into tasks that can be undertaken immediately from those reserved for the future. 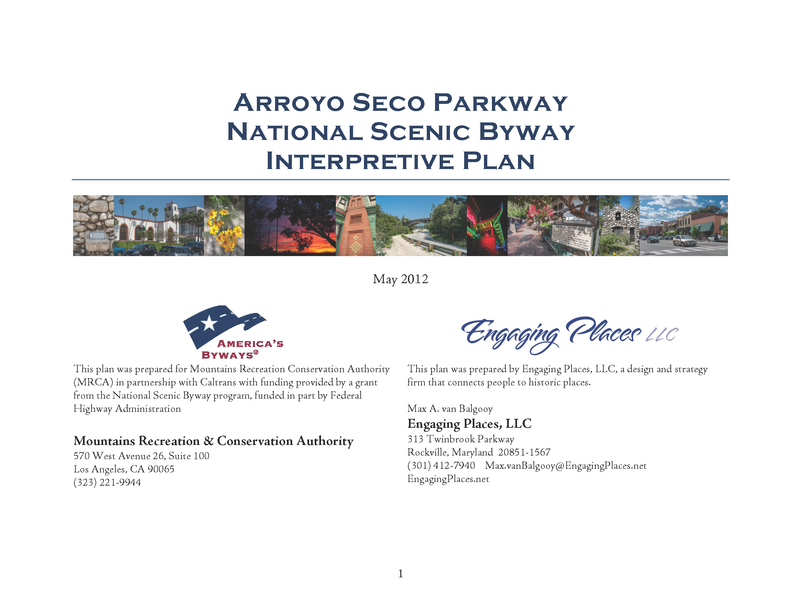 The Arroyo Seco Park National Scenic Byway Interpretive Plan (pdf, 5 Mb) provides more details on the process, but if you’d like to discuss it further, you’re welcome to contact me for more information. Can you tell me why Pasadena Museum of History was not included, or even contacted, about inclusion in this interpretive plan? The client provided the list of three dozen sites to consider and given the budget constraints, we had a few days in which to visit each one to conduct an assessment for the inventory. As you know, this region is incredibly rich in historical, cultural, and natural attractions/sites and this initial effort was to develop a broad sense of the possibilities. Other sites can easily be added but I don’t think it will significantly affect the interpretive themes or recommendations. I know the Pasadena Museum of History (or any other site/organization in the region) will be welcome to participate–the challenge is that there isn’t an association or agency that’s coordinating the implementation of the interpretation plan. The plan does address that weakness and recognizes that it’ll be up to individual sites to take the lead and work with others to make that happen. The Arroyo Seco has great potential to do amazing collaborative programming.